At first glance, you’ll notice that we print beautiful 1.5” thick déKORE prints. What makes us different from everyone else? Everything!! Prices - Our prices are less than half of what other online photo-to-canvas companies charge. Materials - Say goodbye to wrinkled, sagging canvas prints that are stretched and stapled around expensive wood frames. We print directly to déKORETM which is a patented, rigid canvas, structure. These prints are durable, long-lasting, printed with UV inks on a bright white déKORETM canvas substrate. This provides you the best photo reproduction you can imagine! Printing - Each canvas is printed using the latest in UV ink technology. Our state of the art, multi-million dollar manufacturing facility consistently delivers the highest quality image available in the market. Our steadfast UV inks will not fade over time. 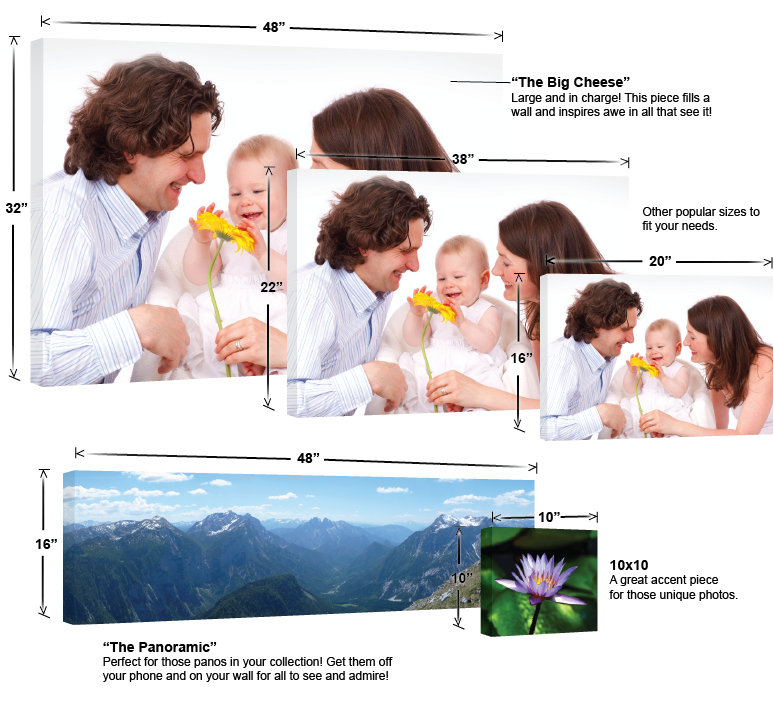 Hanging - With our biggest size weighing in at just 2 pounds, these prints can be hung with the provided 3M Command Strips for an easy, effective and removable option. If you’d rather put a hole in your wall – try a simple thumb tack. No need for heavy hardware or an upset landlord. Surround yourself with images that are current or cherished and make you feel good!! The average person takes 1400 pictures with their phone a year – what do you do with them? We want everyone to be able to afford all of our sizes and grouping offerings. Your home décor shouldn’t be so expensive that it collects dust on your walls. You keep your Facebook and Instagram pages up to date, why not keep your actual walls fresh? Order your déKORETM prints - rotate them seasonally, weekly, yearly – post your photos to your actual walls, without damaging your walls or your wallet.